We’d love your help. Let us know what’s wrong with this preview of Serafina and the Black Cloak by Robert Beatty. Serafina has never had a reason to disobey her pa and venture beyond the grounds of the Biltmore estate. There’s plenty to explore in her grand home, although she must take care to never be seen. None of the rich folk upstairs know that Serafina exists; she and her pa, the estate’s maintenance man, have secretly lived in the basement for as long as Serafina can remember. But when children at the estate start disappearing, only Serafina knows who the culprit is: a terrifying man in a black cloak who stalks Biltmore’s corridors at night. Following her own harrowing escape, Serafina risks everything by joining forces with Braeden Vanderbilt, the young nephew of the Biltmore’s owners. Braeden and Serafina must uncover the Man in the Black Cloak’s true identity... before all of the children vanish one by one. To ask other readers questions about Serafina and the Black Cloak, please sign up. Why did you decide to set this book at the Biltmore? What authors have inspired you? One thing’s for sure: this book can make an interesting Halloween read for young readers. The mysterious, elusive, creature-ish, cloaked man who kidnaps children terrifies Serafina and her new friend. But Sera is courageous, so she will find the missing children and bring back order to Biltmore! It took me a good while to get into this book. The writing is rather dry, especially at first, when so many descriptions are made about Biltmore and its residents and nothing of grand interes One thing’s for sure: this book can make an interesting Halloween read for young readers. It took me a good while to get into this book. The writing is rather dry, especially at first, when so many descriptions are made about Biltmore and its residents and nothing of grand interest has happened yet. But as the story progresses, we become more attached to Sera and her new friend, Breaden. Sera is a critical thinker. I love that so much about her. She questions. She thinks. She finds solutions. She understands. She questions again. Sadly though, there aren’t a whole lot of characters to love, but they all tug at our curiosity, making this a pleasant read, all in all. I’m happy to hear that this has a sequel, because there’s a lot left to discover about Sera and her world. Evidently, I have difficulty spelling the word "cloak." I just typed it in about six different iterations before I achieved the proper spelling. I mean, Serafina and the Black Cloaca would probably be an interesting book--most certainly a foul one--but that's not what Robert Beatty wrote. But I would totally read it. Imagine: a spunky Roman girl finds hints of a mysterious plot at the Forum and gets around the city by swimming the Cloaca Maxima. No? No book deal? Well, actually, that's kind of th Evidently, I have difficulty spelling the word "cloak." I just typed it in about six different iterations before I achieved the proper spelling. I mean, Serafina and the Black Cloaca would probably be an interesting book--most certainly a foul one--but that's not what Robert Beatty wrote. But I would totally read it. Imagine: a spunky Roman girl finds hints of a mysterious plot at the Forum and gets around the city by swimming the Cloaca Maxima. No? No book deal? Well, actually, that's kind of the plot of Serafina and the Black Cloak. (Right. I'm copy-pasting "cloak" so I don't have to type it anymore). Serafina and her father live in the boiler room of the great Biltmore Estate in Asheville, North Carolina. Her father is an engineer, and a very good one at that, but he strictly informs Serafina that she must never be seen by anyone in the house, nor must she reveal that they sleep in the boiler room. So, right now you're thinking that we either have a Quasimodo situation on our hands, or that this is a Disneyfied version of a V.C. Andrews story. Actually, it's neither. Serafina is preternaturally quiet, and only has eight toes, but is otherwise a relatively normal human girl. Sort of. One night while prowling the mansion for rats (she's the C.R.C. : Certified Rat Catcher), Serafina witnesses a creepy man in an even creepier black cloak chase and kind of consume a young girl. The next morning, the Brahms family discovers that their beautiful piano prodigy of a daughter is missing! Dun dun DUNNNN! Almost every night after that, a child goes missing. Only Serafina knows that it is Black Cloak, but she doesn't say anything about it because ... reasons. She also strikes up an extremely unlikely friendship with the Vanderbilt's nephew, Braeden, who is, of course, kind and sweet and totally unstuffy. Oh, for pete's sake. I'm tired and I'm sick and I don't want to tiptoe around the issue any longer: Serafina and the Black Cloak was profoundly disappointing. The characters were one-dimensional, I guessed Serafina's secret right away (and I think the more discerning kid readers will, as well--especially if they're cat-obsessed) and the Boss Battle at the end was profoundly boring. Like, that's it? That's all you had to do? In the afterword, the author states that he wrote this book to give his daughters a strong girl to look up to. I'm curious as to his definition of "strong female character." Serafina pretty much just does what other men tell her to do, and when the nephew's life is in danger, she says that she would die to save him. Okay, I'm not saying that it is ignoble or worthless to die for someone--but her situation would easily be remedied with a little forethought or planning. Instead of just dramatically dying for a boy, why wouldn't you get help? She values her life less than that of a boy she's been friends with for a very short period of time. One benefit of reading this is now I am extremely intrigued by Asheville and the Biltmore Estate, and it's definitely going on my to-see-travel list. However, for a story set in the south (or The South, depending on how you feel about the Southernness of North Carolina), the vernacular didn't ring particularly true to me, nor did it reflect the racial makeup of the area at the time. Now, you might say, "Librarian Pam! Kids don't care about that!" and I'll say, "Yes, they do! Because they see themselves in stories, and if they are POC, they will not see themselves in this story at all!" When I started the book, I was hoping that Serafina was African-American. Nope. White. Why didn't the author give us a strong, black girl character? Why not? Serafina is a 12 year old girl who lives in the Vanderbilt mansion, called the Biltmore Estate, with her pa. Well, they don't exactly live there properly. They secretly live in the basement and no one knows she exists. Her pa is the maintenance man and never really told her about where she came from or who her mother was, until a man in a black cloak comes and children start disappearing. So this is probably not exactly "Young Adult," and more geared towards older kids/younger teens, but it's a solid fantasy tale about an unusual girl who is more than she appears, and who ends up saving the day (of course). I liked Serafina. Even though she didn't really know anything about herself, she was strong, and still followed her instincts. At first I was annoyed with her dad, but I ended up understanding why he did what he did (and besides, this is for a younger crowd, so you have to kind of not analyze things too much). For example, and I don't think this a spoiler, but Serafina only wore large man-shirts tied at the waist with an old rope or belt, and for an adult, it's like, come on, she could have gotten some hand-me-downs no matter how poor they were. But, it makes for a certain charm, and adds to who Serafina is. She cares more about catching rats than what she is wearing, and her pa is too busy fixing machines in the Vanderbilt's basement. I could emotionally relate to the idea that some people resonate more with animals and nature than other people, and Serafina meets a kindred spirit who is like her in that respect. This isn't a complicated book, but it's cute and well-written for its target audience. Gorgeous cover though, am I right??!! I can say I am lucky in terms of middle grade novel these days since I liked every middle grade novel I've read lately. Or maybe, just maybe, these books tug the child in me so a part of me liked the books eventually. Serafina and the Black Cloak is not an exemption. This precious little book is a middle grade novel about Serafina (obviously) and her adventure together with her friend Braeden in unraveling the true identity of the Black Cloak Man. And also, her peculiarity and finding her self, her true self, literally. It displayed a true sense of friendship, family love and the appreciation of individuality. It has an enough amount of action, drama, humor and dread. Even the middle part is quite boring, I really enjoyed it as a whole. Actually, I was flying through the pages after that 'slow part', since the book had gone edgy, exciting and thrilling. I was so compelled to find out what will happen next even part of me knows what I will get. The anticipation is real, I swear. And in no time, I finished this book, feeling contented with the ending. It's a bit cliché but it warms my heart, nonetheless. Serafina and the Black Cloak was a one-of-a-kind mystery thriller, peppered with an old fashioned ambiance and ominous tone. I was entranced from the very beginning - it's the kind of story that grants you an escape from reality and an entirety of reading enjoyment. Thus, if you are looking for a story that captivities through a blend of character-driven story surrounded by an unsettling, chilling, beautiful and haunting setting, then be sure to pick up this one up! It is unquestionably, a middle-grade lover’s delight, and I cannot recommend it enough. Did evil creatures think of themselves as evil? Or did they think they were doing what was right? Was evil something that was in your heart or was it how people viewed you? In light of my recent letdown with the middle grade genre, Serafina and the Black Cloak has revived my overly enthusiastic craze for middle-grade literature and I am so incredibly grateful that it did! Closer to a 1.5. I *really* didn't like this book. I'm a firm believer that kids need creepy. There's a reason Goosebumps and Scary Stories to Tell in the Dark have persevered over time, and Serafina and the Black Cloak tries pretty hard to be in that same vein, but ends up wildly missing the mark. Serafina is a girl who was found in the woods, battered and broken. Taken in by a man and kept secret for the first decade or so of her life, she is witness to a strange disappearance that she feels uni Closer to a 1.5. I *really* didn't like this book. Serafina is a girl who was found in the woods, battered and broken. Taken in by a man and kept secret for the first decade or so of her life, she is witness to a strange disappearance that she feels uniquely qualified to get to the bottom of, and so begins our tale of Serafina exploring and uncovering a dark, weird secret. The first bit of the book, the parts that establish who Serafina is and what she's really up to? Pretty great. The moment we get to the meat of the plot, however, the story screeches almost to a halt, with a few interesting scenes scattered amongst a tale that plods toward a conclusion - a conclusion, by the way, that is a very pat, firm, almost Disney-style ending that nearly betrays the entire tale. It's a frustrating read because all the parts are there for a truly great read with some really interesting elements, but basically only a third of the story is really truly worth the time or effort, leading to a supremely disappointing story. This was kind of disappointing. I don't know what I was expecting but this book was very slow. While I was learning about Seraphina and her life at the start it was interesting but then the story almost completely halted. It was just description after description and I was getting bored. The characters were one-dimensional and didn't seem very authentic. The story was quite predictable but it wasn't a horrible story. I might read the next one as I'm willing to give it a chance but I'll see. I saw the book trailer for this and thought, "Hmmm. Fascinating. I want to read this." Turns out, that trailer is pretty much the abridged version of the entire story. I'd 2.5 this puppy. It's not bad but I've come to expect better from Disney-Hyperion. I had some problems as a grown-up reader. The first thing that bothered me: speech patterns are all over the place, especially for Serafina who hops between uneducated vernacular (she calls horses “hoof-stompers” as if she had to make up her own wor I saw the book trailer for this and thought, "Hmmm. Fascinating. I want to read this." The first thing that bothered me: speech patterns are all over the place, especially for Serafina who hops between uneducated vernacular (she calls horses “hoof-stompers” as if she had to make up her own word for them because she didn’t know what they were despite the fact she’s well-read and she apparently spies on people all the time, including the people around the stables) to contemporary sarcasm (“Oh great. If I can’t see, I’m gonna get lost for sure…” p. 133) to new-age envisioning (“The wolf doesn’t know I'm here. I’m one with the forest. I’m camouflaged and silent”) Other characters display some of this, as well, but not to the same extent as Serafina. And then there was the problem of stereotyping female behavior. “I’m going to ask you a question,” she said. “All right,” he said softly, sitting up in his bed. It stunned her when he did not reply right away, when he did not immediately deny it. He didn’t say anything at all. He hesitated. For a long time. Every second that went by was like a dagger in her heart because she knew it was true. “Would you just as soon I go?” she said quietly, trying to understand. “Try,” she said, praying that he wasn’t just abut to tell her that he felt nothing for her and just wanted to be alone. Serafina smiled, “You really didn’t want to leave Biltmore that bad?” Still smiling, she took a few steps forward and sat on the edge of the bed beside him. “Yes, you are different, Serafina...very different...maybe even strange, like you say...I don’t know...but…” His words faded, and he did not continue. “But maybe that’s all right with you,” she said tentatively, thinking she understood him. “Yes, I think it’s what I like about you,” he said, and there was a long pause between them. “So, we’re friends,” she said finally, her heart beating as she waited for his answer. Now, the overly-dramatic writing irked me but that's because I'm old and bitter. Writing aside, here's what I question after moments like the one above: Serafina is a partially feral, basement-dwelling child who is well-read but stays hidden during the day and catches rats in the Biltmore Estate at night. We know there's something different about her, we just don't know what. She's only been exposed to culture via books and has gleaned whatever social knowledge she has from spying on people around the estate. Given all that, why is she acting like a coquette around Braeden, fishing for compliments on her looks and wanting to be reassured that she's not weird? Why does she differentiate between male and female roles? Does this all come from the books she's read? She's learned nothing but patriarchy and emotional manipulation? Why did it have to go this way? “You mean heroine,” Mrs. Vanderbilt said. Because only men can be heroes, you see. Females have their own term and it’s meant to convey less amounts of heroism because we all know that when you add -ine to feminize a word, you've just cut its potency in half. Now remember, these reactions are coming from a place of being sick of girls getting short-shrifted for doing what would be considered awesome if a boy did it. This is not the reaction pre- and early-teens are going to have when reading this story. As a book for kids, it is fun, suspenseful, a little scary, a little romantic, and fully adventurous. I've been recommending this to the 8-15 crowd all summer long, my cousins, especially, after they visited the Biltmore Estate. It's not a bad book, even though I didn't like the writing. It's appropriate for its audience and I think it will be well-received. It's just that...maybe expect to have a talk about equality afterward? Set at the Biltmore Estate in Asheville, NC (about an hour north of me), this middle-grade novel has everything! An independent female protagonist with unique abilities, a mystery, some fantastical elements, historical setting, and gorgeous rooms and clothing. And since Disney is the publisher, they were able to get the actual location to film their book trailer. Step into the wonderfully whimsical world of Serafina and the Black Cloak, by Robert Beatty, and chances are, you'll be completely enchanted by its magical setting, valiant young heroes, and dark mysteries. Mr. Beatty deftly builds a unique world full of beautiful details that effortlessly drew me in. Nestled in a forested valley by the French Broad River in Asheville, North Carolina, is Biltmore Estate (there really is such a place). Within the basement of this vast mansion, Serafina, the Chief Rat Catcher (C.R.C. ), and her father, the estate’s maintenance man, have secretly lived down there for as long as she can remember. With the entire estate to roam, she must take care never to be seen by the rich folks upstairs, and never to leave the estate grounds to venture into the forbidden forest nearby. But, when the children of the estate begin to vanish, only Serafina knows the truth. Her life is thrown into turmoil on the night that she witnessed the Man in the Black Cloak vaporized a child into thin air. And now, he wants her. With the help of Braeden Vanderbilt, the young master of Biltmore Estate, they must stop him before he strikes again. Serafina’s hunt leads her into the very forest she is taught to fear. There, she discovers a forgotten magic that is tied to her mysterious identity. Brave and young characters have always held a special place in my heart. Personally, I believe children should nap and eat cookies, not fight the evils of the world. So, I absolutely love Serafina and Braeden. Serafina is unique—eccentric even. But more than that, she possesses a sweet and kind nature with an adorable spunky and fiery personality to match. In contrast, Braeden, is quiet and highly revered. Even born into privilege, he is the pillar of compassion and understanding. I admire how Mr. Beatty explores the uniqueness of individuals like Serafina and Braeden, reminds us to embrace such differences, and that sometimes what makes us different is also what makes us special. Despite being a middle grade book, there was an aura of death and darkness that was unexpected, yet alluring. I was thrown off tangent many times as to the identity of the Man in the Black Cloak. Oh you are good Mr. Beatty! I underestimated its complexity. The innuendos were just perfect where no one was obviously bad or good. Unlike Serafina, C.R.C., I could not smell the “rat.” The story moves forward with new and unexpected revelations that kept me guessing and wanting more. I also got a kick out of the fun vocabulary. It was so amusing to come across these words: skullduggery, caterwauled, chickadees, skedaddle, and many more. The diction was quite entertaining. "There are many mysteries in the world, both dark and bright." Serafina lives in the basement of the magnificent Biltmore mansion, the home of the wealthy and influential Vanderbilt family. She's lived there all of her life with her Pa taking care of her, but the Vanderbilts have no idea that she's even alive. And they probably never would have, that is until one of the Vanderbilt's young guests mysteriously disappears and Serafina, herself, witnesses what happens to her: something dark and unexpl "There are many mysteries in the world, both dark and bright." And they probably never would have, that is until one of the Vanderbilt's young guests mysteriously disappears and Serafina, herself, witnesses what happens to her: something dark and unexplainable. She knows it's up to her to get to the bottom of that and other recent disappearances around the mansion in order to get the little girl back where she belongs. 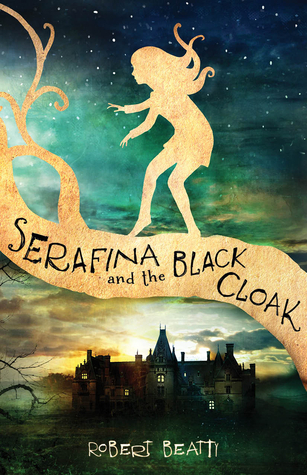 Serafina and the Black Cloak is the first in a series about the adventures of a headstrong, independent girl, who is so much more than she seems on the surface. The writing is well-paced and nicely descriptive. I lived in Asheville for a while and have many fond memories of the Biltmore estate and the gorgeous mansion on its grounds. The house is huge and beautiful during the day, but I can easily imagine how it could appear dark and gloomy at night - the perfect setting for this spooky story! The book is listed as a late elementary to middle-grade paranormal mystery, but I found it to be a very dark thriller (maybe even horror) in places. My 10-year old can still be frightened by dark themes, so I believe that I will wait a while before letting her read this series (I removed it from my read-along shelf). I'm not even exaggerating, the Black Cloak is very scary and violent - even for some adults. A strange and gothic tale set at the very real Biltmore Mansion. Serafina is an uncanny child, with many secrets, but she's not the only one. I was a little freaked out by some of the secrets, to be honest, but it was definitely an exciting and very unusual book! A fantastical thriller that takes place in the early days of the gorgeous Biltmore Estate? Count me in! When I found out about the existence of this book, I was elated. Biltmore has always been one of my favorite places to visit; it fascinates me. The way real details of the house and estate have been woven into this remarkable story about Serafina and her pursuit of the Black Cloak is inspired. Having been there myself, it was easy to imagine our heroine prowling through the halls at night. And A fantastical thriller that takes place in the early days of the gorgeous Biltmore Estate? Count me in! When I found out about the existence of this book, I was elated. Biltmore has always been one of my favorite places to visit; it fascinates me. The way real details of the house and estate have been woven into this remarkable story about Serafina and her pursuit of the Black Cloak is inspired. Having been there myself, it was easy to imagine our heroine prowling through the halls at night. And let's not forget the spunky Serafina! She is so easy to love - I found myself wanting to jump into the story and be her best friend. Her road to self-discovery is not an easy one, but I very much enjoyed the privilege of riding it with her. I love that this book can appeal to so many audiences - fans of historical fiction, thrillers, mysteries, ghost stories, fantasy, the supernatural, friendship stories, tales of growing up, and even those who are just interested in Biltmore. I personally will be buying this for my school's library the second my funds for the new year come in! I had very high hopes from this book, I'm not even sure why. I just thought it was going to be one of those gems you stumble onto, sadly it didn't live up to the hype I had set-up in my head. For the most part, this book was fairly good. The writing was solid, again for the most part and the lead character was interesting enough. The plot was probably the strongest part of the book - it was intrigued and frightening and had a nice mystery to it. I actually have no idea why every time I picked up this book I couldn't really get into it. It came close to putting me into a slump. I normally blow through middle-grade novels. I think my problem with this book is that the narrative was kind of repetitive. I get tired fast when I'm constantly being reminded of certain things throughout the story. Also, the side characters weren't that interesting and most of the time the side characters really make or break the book for me. There were times I was really invested in the story but then it would slow down again and it would lose my attention. Last thing that really bothered me was that the author didn't keep the protagonist very consistent. Her way of talking changed several times. It was like he couldn't decided if she was educated or not and it showed. It made for some really awkward exchanges. I would strongly say this book is for older middle-grade readers or children who do not scare easy. There is some intense violence and graphic details. The cloaked figure has bloodied hands, steals children in the night and whispers scary things while he stalks them. That might be too intense for an eight year old. When I was little I ate up scary books so this probably would've been a good fit when I was much younger. I still love a dark middle-grade novel because I feel like the higher the stakes for the characters, the more likely you will be drawn into the story and root for the heroes. I think this book is worth looking into if the plot interests you. It's far from a horrible book, I just couldn't fall in love with this tale. I did buy the second book at the same time I bought the first book (that is how much faith I had in this one) so I will likely give the second book a go. I'm hoping there will be less repeating and more focusing on the actual tale. What a fun and intriguing story! I really wish there had been the YA selection there is now, when I was a child of the 80's. I would have loved these books even more if I'd gotten to read them as an actual YA. This is a great little fairytale and I'll definitely read the next one. My kids will love it too. Serafina is a strong little girl, in spirit and in nature. With the right pick, she'd make a great character for the big screen. This was a different story, not your usual kind of YA fairytale What a fun and intriguing story! This was a different story, not your usual kind of YA fairytale and the last sentence was very powerful. Recommended to readers of YA. Мрачна, мистериозна и напълно невероятна история за едно малко момиче, търсещо мястото си в света. Създанената атмосфера в книгата беше уникална и определено влезнах в тъмния сюжет! Чудесна книга както за деца, така и за възрастни! Biltmore Estate is large enough to have kept a secret for over a decade: deep within its basement lives a man and his daughter, named Serafina. Serafina’s father is in charge of the buildings maintenance but he would be tossed out in a heartbeat if it were discovered he also resided there. And Serafina is a whole different matter. Curious about the world around her and of her own past, she’s no longer able to keep herself confined to the basement, especially when she witnesses the murder of a young girl. Her body was never discovered and by the following morning another child was missing. Serafina is determined to help these people find their lost children, even if it means disclosing her secret. Beatty created a most mysterious girl with Serafina, who is described as having golden eyes and strangely enough, four toes instead of the normal five. Those differences only add to the air of mystery surrounding her and keep you wondering what it is that makes her so special. She’s a girl with a good heart and a kind soul that you can’t help but admire. Befriending the owner’s of Biltmore’s nephew, Braeden, makes this story even more charming. The two quickly hit it off, despite their obvious differences in social class, and they both team up convinced that they’re going to be able to find these children. Through her friendship, Serafina starts seeing the world through a new set of eyes, only seen before through the pages of books. She sees the good in the world but because of the man in the black cloak, she’s also uncovering the bad as well. Serafina possesses a definite horror, but isn’t quite as terrifying as it is charming. 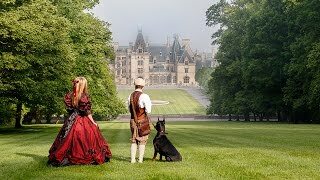 The unique heroine is definitely the spotlight of this tale with her most uncommon story of her life and how she came to reside in the Biltmore Estate basement. While some parts of the book did seem to creep along very slowly and some aspects weren’t left sufficiently explained, it was still ultimately a satisfying supernatural tale of mystery that will no doubt delight children and adults alike. There's nothing in particular wrong with this book. The writing is fine - poetical at times - the characters are interesting. There is stuff going on...but it's happening at about a snail's pace. There's so much explaining of everything that I'm bored in between, waiting for stuff to happen. Снощи най-после успях да я дочета. Много е гадно да знаеш края, обаче не и как героите стигат до него. Хубава детска книга с необходимата доза мрак, за да учи на разни неща и да е искрена. Harry Potter serisi kurgu, karakterler, ortam ve hissiyat açısından 10 üzerinden 8 ve Percy Jackson aynı değerlendirmede 3 alırsa (2-5 yaş arası alfabe kitaplarını 1-2 olarak yazıyorum) bu kitap da olsa olsa 10 üzerinden 5 olur. Hani kime önerirsin derseniz 8-12 yaş arası korkumsu gerilimsi mistik hikayeler okumak isteyen çocuklara öneririm. Ceylan cesetleri, parçalanan bedenler, mezarlık hikayeleri gibi çocukların kaçınması gereken öğeler var ama yazım yaşı bundan daha öte değil. Percy Jackson'd Harry Potter serisi kurgu, karakterler, ortam ve hissiyat açısından 10 üzerinden 8 ve Percy Jackson aynı değerlendirmede 3 alırsa (2-5 yaş arası alfabe kitaplarını 1-2 olarak yazıyorum) bu kitap da olsa olsa 10 üzerinden 5 olur. Hani kime önerirsin derseniz 8-12 yaş arası korkumsu gerilimsi mistik hikayeler okumak isteyen çocuklara öneririm. Ceylan cesetleri, parçalanan bedenler, mezarlık hikayeleri gibi çocukların kaçınması gereken öğeler var ama yazım yaşı bundan daha öte değil. Percy Jackson'da gerçekten zeka yaşım düşmüştü. Bunda öyle hissetmedim. Serafina kesinlikle sevilesi ve bağ kurulası bir karakterdi. Yalnızca kurgu çok basit, mistik olay çok net, kötü adam çok belli. Hatta asıl heyecanla beklenen nokta Siyah Pelerin'in sahibinden çok Serafina'nın "ne" olduğuydu. Percy Jackson'ın ikinci kitabıyla devam etme konusunda çekincedeyim ama bunu mutlaka alırım gibi duruyor. Who and what defines good and bad? Twelve year old Serafina tackles this question and many more in Serafina and the Black Cloak. Uniquely set in the historical, Vanderbilt Biltmore Estate and surrounding forests of North Carolina, the author has captivated the essential coming-of-age struggles we all must reconcile: What is normal? Who is a true friend and why is it so difficult to find them? Why am I different? Although this story is set in 1899 and is historical fiction, its timeless themes are the true nature of a classic novel and will speak to middle school and high school readers (not to mention adults) . The paranormal events surrounding Serafina’s birth—and the basis of this thrilling mystery—address the ageless battle of good versus evil and whether outside forces can (and should) shape who we are. With its engaging mix of historical setting and magical elements, this thought provoking novel is a perfect vehicle to pique young readers’ interest in historical fiction. Middle school and high school teachers and librarians will find the well-developed characters, the Gilded Age mansion, the chilling cemetery scenes, and the mystical black cloak the perfect combination to motivate discussions and fulfill many Common Core curriculum elements of Language Arts and/or history requirements. I had the pleasure last week of reading an advance copy of Serafina and the Black Cloak by Robert Beatty. Serafina, to be published by Disney, is a page-turner that is sure to be a hit with the younger set (as well as many adults, like me!). Serafina and the Black Cloak is an adventure/mystery that takes place at the Vanderbilt Biltmore Estate deep in rural North Carolina. Dark, foreboding woods surround the estate. Our heroine, Serafina, has a mysterious past somehow tied to that frightening fo I had the pleasure last week of reading an advance copy of Serafina and the Black Cloak by Robert Beatty. Serafina, to be published by Disney, is a page-turner that is sure to be a hit with the younger set (as well as many adults, like me!). Serafina and the Black Cloak is an adventure/mystery that takes place at the Vanderbilt Biltmore Estate deep in rural North Carolina. Dark, foreboding woods surround the estate. Our heroine, Serafina, has a mysterious past somehow tied to that frightening forest, but try as she might she cannot unravel her own shadowed beginnings. Instead she lives with her Pa in the bowels of the Biltmore Estate, unknown to the Vanderbilts. Her Pa works at the estate; Serafina catches rats at night with uncanny acumen. He tells her she must remain hidden, so in twelve years Serafina has never had a friend. As Serafina struggles to understand her origin, children begin to disappear from the estate. No one knows who has taken them, nor where they have been taken. Only Serafina has secretly witnessed one of the small girls being spirited away by a man in a black cloak, but her Pa won't let her step out of the shadows to tell anyone. Risking everything, Serafina approaches 12-year old Braeden Vanderbilt and shares her secret. Together Sera and Braeden begin to tackle the mystery, each realizing it is the first time they have ever had a friend. More and more children disappear, and finally, the tension and her own need for self-identity reaching a crescendo, Serafina strikes out into the foreboding woods, where she is determined to solve both the mystery of the missing children, and of her own origin. To do so has major consequences: not only must she face her fears of what she might find in the forest, but she also risks losing her friendship with Braeden. Serafina y la capa negra es un middle-grade muy diferente, me ha sorprendido que fuera tan tenebroso y misterioso teniendo en cuenta el público al que está enfocado. Tenemos una niña distinta al resto, misteriosas desapariciones relacionadas con un hombre que lleva una capa negra, secretos, misterio y algo de fantasía, todo ello perfectamente hilado hasta culminar en un desenlace muy emocionante. Me gusta que el autor vaya dejando pistas por aquí y por allá del hombre de la ca En realidad un 3,5. Serafina y la capa negra es un middle-grade muy diferente, me ha sorprendido que fuera tan tenebroso y misterioso teniendo en cuenta el público al que está enfocado. Tenemos una niña distinta al resto, misteriosas desapariciones relacionadas con un hombre que lleva una capa negra, secretos, misterio y algo de fantasía, todo ello perfectamente hilado hasta culminar en un desenlace muy emocionante. Me gusta que el autor vaya dejando pistas por aquí y por allá del hombre de la capa negra para que hasta que no llegues casi al final no lo averigües; a su vez también es genial que no solo se centre en las extrañas desapariciones sino que nos va picando con el pasado y origen de Serafina, con cómo ve ella el mundo y que la familia y la amistad estén tan presentes y sean tan importantes. Todo esto le da mucho más valor a la novela y aunque no me agrado que en algunos momentos no pasara gran cosa y tuviera un ritmo un poco lento, por lo demás me ha resultado muy innovador. Otra cosa que vais a encontrar es que el libro tiene una prosa muy elegante, con unas pinceladas de fantasía originales y una destreza con las palabras maravillosa, no cuenta con muchos diálogos sino que se centra en describir lo que ve y siente Serafina. How I loved Serafina! Absolutely marvelous, creepy, fun, atmospheric read. I read it all in one sitting. I think many young people will do so as well. Great title. The first thing that convinced me to pick up a copy of Serafina And The Black Cloak was the gorgeous cover. In fact, I didn't realize until later that this was actually a middle grade story... Although I personally like reading a middle grade book every once in a while. This story written by Robert Beatty has both an interesting setting and the perfect mix of fantasy and scary elements. It's what you call a 'light' horror read that will entertain both a ten-year-old and an adult alike. The prose is really accessible and I loved the descriptions of both the mansion, forest and magical elements in the story. The main character Serafina wins over your heart in a blink of the eye and I loved the mystery around her character. The mysterious man in the black cloak is scary enough, but not too much to give the younger ones nightmares... And I really liked the ending. In short, Serafina And The Black Cloak was a more than satisfying read that I can recommend if you are looking for a middle grade fantasy book. Serafina never knew her mother and has been growing up living in the basement of the Biltmore estate with her father. He works as a maintenance man during the day and hides away at night; nobody knows he sleeps in the basement and they don't know that Serafina even exists. Her pa asks her only two things: she must take care to never been seen and she never has to venture too far into the forest. Serafina is not a normal child and has quite a few special skills. As silent as the night, her dad gave her the job of Chief Rat Catcher; she is able to catch rats with her bare hands... One day, children start disappearing at the estate. Nobody knows who is behind it except Serafina. Roaming around unseen that night, she saw a man in a black cloak stalking the corridors at night and taking away a young girl. She is determined to stop the man, but will she be able to even when nobody seems to believe her or can really see her in the first place? Serafina lives in the basement of the Bilmore House, unseen by any but her pa. They've lived there secretly since the house was built, and her pa has always cautioned her never to be seen. So Serafina scuttles around the house at night, taking joy in catching any rat she comes across. (That she catches them and then throws them outside the Houses's walls is my first annoyance--it seems so anachronistic and against (view spoiler)[Serafina's true nature of were-mountain lion (hide spoiler)].) Then Serafina lives in the basement of the Bilmore House, unseen by any but her pa. They've lived there secretly since the house was built, and her pa has always cautioned her never to be seen. So Serafina scuttles around the house at night, taking joy in catching any rat she comes across. (That she catches them and then throws them outside the Houses's walls is my first annoyance--it seems so anachronistic and against (view spoiler)[Serafina's true nature of were-mountain lion (hide spoiler)].) Then one night she sees a terrifying man spread his black cloak across a little girl and swallow her whole. From then on, Serafina is on a mission to discover who and what the man in the black cloak is. She's swiftly joined by the sensitive, animal-loving Vanderbilt heir, and together they solve the mystery. Robert Beatty is the author of the #1 New York Times best-selling Serafina series published by Disney Hyperion, a spooky mystery-thriller about a brave and unusual girl who lives secretly in the basement of the grand Biltmore Estate. Serafina and the Black Cloak was a #1 New York Times best seller, has been on the list for more than 60 weeks, and won the prestigious 2016 Pat Conroy Southern Book Pr Robert Beatty is the author of the #1 New York Times best-selling Serafina series published by Disney Hyperion, a spooky mystery-thriller about a brave and unusual girl who lives secretly in the basement of the grand Biltmore Estate. Serafina and the Black Cloak was a #1 New York Times best seller, has been on the list for more than 60 weeks, and won the prestigious 2016 Pat Conroy Southern Book Prize. The second book in the series, Serafina and the Twisted Staff, became a #1 New York Times best seller in the first week of its launch and earned a "Starred Review" from Kirkus Reviews, which said, "Even better than its predecessor, a sequel that delivers nonstop thrills from beginning to end." Enjoyed by both young readers and adults, the books are being taught in over a thousand classrooms nationwide. The third book in the series, Serafina and the Splintered Heart, launched in July 2017 to much acclaim. The hotly-anticipated fourth book, Serafina and the Seven Stars, is currently available for pre-order and will be released in July 2019.